All three volumes are newly edited and reformatted in a handy workbook size for ease of teacher reference in preparing main lesson presentations and experiments. First a series of three volumes on physics for the middle school science teacher, Volume 1 for Grade 6 deals with the basic pedagogical and epistemological principles of acoustics, optics, heat, magnetism and electricity. Written especially for class teachers in Waldorf schools, but accessible to the homeschooling parent, each volume begins with a basic introduction and strives to create familiarity with the phenomena. After rich experience is gathered, age-appropriate discussions and theoretical concepts are introduced. The text includes many examples of demonstration experiments for the main lesson. Volume 2 for Grade 7 includes further studies in the areas presented this first book and adds a section on mechanics. 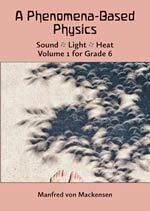 Volume 3 for Grade 8 continues the explorations in sound, light, and heat plus hydraulics, hydrostatics, and aeromechanics. 7″ x 10″, 130pp., 2017.